Good morning evening everyone! A new Nosh Show is available now, episode 35, and yet again we talked about energy drinks for a little bit. I try to do a bit of mental show prep during my commutes and a thought ran through my mind: Why does no one make a caffeinated milk drink? I know of iced coffees and whatnot, but I mean a straight up chocolate milk with added caffeine. Well, I stopped at one of the bigger gas stations on the way to work and what do I see next to the starbucks double shots and the muscle milk, Monster Energy Shakes! Four flavors in all before me: Vanilla, Chocolate, Coffee and Strawberry. It's $3.59 and I really don't want to spend that much, but my curiosity has been piqued. I need this in my morning! I take a whiff and it has a very sweet but artificial smell, it reminds me of something... It smells like Otto's Cupcake from Perry's Ice Cream! Ha, that's just weird. I take a sip and it's drinkable, but just barely. There is a lot of chemical magic happening here. It's like a slimy chocolate skim milk. You need to drink it quick, it's nothing you can savor because the first sip after a break always has a bit of a shock to it. If that wasn't bad enough, the taste does linger... a lot.... like hours later. I can still taste all the artificial sliminess of it all, much like that terrible MilkSplash product. I'm sorry, but this is gross. I can't believe I managed to drink most of it. To add insult to injury, there didn't even seem to be that much of a pick me up to the drink. I know, I know, it's a workout drink, not a commuting drink, but it has 151 mg of caffeine per can! Mtn Dew Kickstart only has 92 mg and I thought that made me way more awake than this did. I don't know.... maybe I was just too tired to notice.... or maybe energy drinks just don't really do that much for me in general. Oh well. I just should have bought a much tastier Hershey's Milk Shake instead. 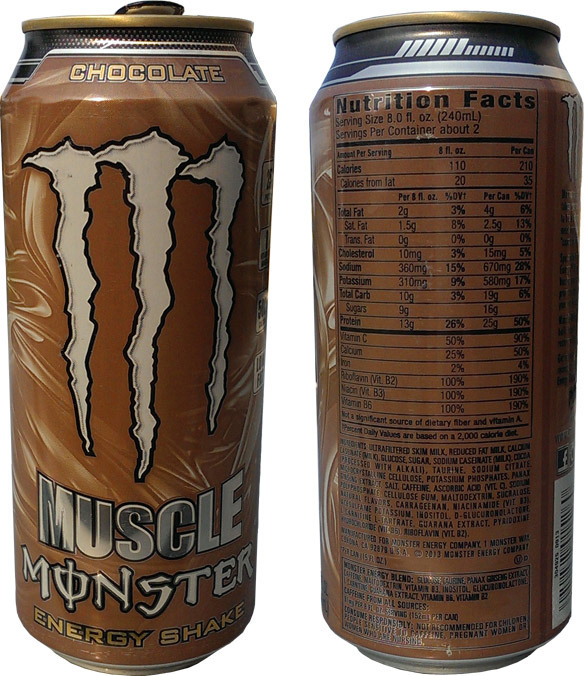 Muscle Monster is actually intended for a post recovery workout shake, and that the reason for the 20 grams of whey protein. I use to really enjoy the coffee flavor after my track workouts and two hour long runs, and I always really enjoyed it. However, I am use to drinking protein shakes with whey protein, so its not so off-putting for me. Hey, yeah, I know I should have burnt a fair amount of energy first, but I'm a sucker for anything labeled milkshake. I still think there was a weirdness between the low fat milk, the chemicals, and all that. I don't think it was the whey that bothered me so much as the fake sugars and whatnot.